Estee Lauder will launch Private Collection Tuberose Gardenia in August. The scent is the first of a projected series of fragrances inspired by "Estée Lauder's most aspirational fragrance", Private Collection, introduced in 1973. Private Collection Tuberose Gardenia is the creation of Aerin Lauder, Estee Lauder's granddaughter and the brand's Creative Director and Executive Vice President. The fragrance features neroli, lilac, rosewood, tuberose, gardenia, orange flower, jasmine, white lily, carnation and vanilla bourbon. 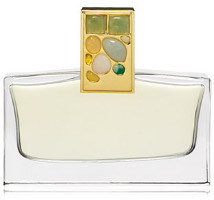 Estee Lauder Private Collection Tuberose Gardenia will be available in Parfum in a bottle with a "gem-encrusted gold cap inspired by a Josef Hoffmann brooch" (30 ml $300) or in Eau de Parfum (30 ml $65, 75 ml $120). Distribution will be limited to high end department stores. (via Women's Wear Daily) Update: see a review of Estee Lauder Private Collection Tuberose Gardenia. The outside packaging of the Mustang fragrance is a graphite metal reusable Collector''s Tin with the legendary Mustang Pony logo on the label. 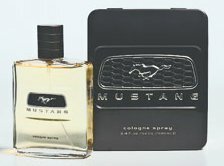 The new men''s fragrance embodies the spirit of the Mustang man while remaining true to the values of manhood and legend of the Mustang brand. The Mustang fragrance exemplifies the allure of the Mustang man - bold, daring and legendary. The heart of the fragrance, a fusion of pipe tobacco and cedarwood, evokes a daring ruggedness, appealing to today's confident and strong man. ...is characterized as a "rugged oriental." It has top notes of lavender, ginger and lemon; a heart of pipe tobacco and cedar wood, and a drydown of amber, fir balsam and patchouli. “Mustang” sounds cheap. It sounds like one of those 1970s men's scents like Hai Karate, or an Avon scent that came packaged in a car or a scrimshaw bottle or whatever. It really is a terrible name. Perhaps the advertising geniuses can think of a way to market it; I wish them luck. My guess is that Hai Karate could reinvent itself in much the same way that Old Spice is doing now, actually! I recently re-discovered Private Collection (original) when I received a parfum mini from a RAOK. What a beautiful green chypre. I don't have high hopes for PC Tuberose Gardenia. Doubtless, it went through focus group testing and conforms to marketing considerations, unlike the original which was formulated for Lauder's private use. I've never tried it — if it is a beautiful green chypre, I must! living out their independence in an urban jeans look. is the catchy slogan for the ad. are sandalwood, cedarwood, moss, and musk. Both fragrances will launch from mid-September 2006. As I've said before, I know nothing about trademark issues, but these naming issues rarely seem to end up being a problem. Also not sure that the Mustang jeans scents are sold in the US. Pretty hard to believe Estee Lauder can release this fragrance with Mustang Jeans already in the market. Compare bottles at the link below. To argue a consumer would NOT be confused if they saw both of these bottles side by side is pretty ridiculous, even if one is released in the mass market and the other in department stores. that mustang horse is pretty much the same to my eyes.